Believe me, I know it's one of those "first-world" problems to complain about too many kiwis. Especially right smack in the heart of what should be winter. (Although I hesitate to use that term, when it's warm and sunny and hasn't rained in weeks). But the fact is, that in the past few weeks, we have had such an abundance of kiwi that I have sliced them up with breakfast, added them to my morning protein shake, put them in lunch boxes (slice in half and packed with a spoon), peeled a bowl full of them for the dinner table, and tried to offer them as an after-school snack. My kids love kiwis, but even they draw the line somewhere. At any rate, as I started to make yet another kiwi strawberry smoothie, I was inspired. The kids love kiwi-strawberry juice. I love strawberry lemonade. Why not kiwi lemonade? It's delicious on its own, and it takes on a whole new level of irresistibility when a shot of vodka is added to your glass. On a side note: In my grandmother's cookbook, the very few cocktail recipes call for a "jigger" of liquor, rather than a shot. Doesn't that sounds a bit like a work that shouldn't be used in polite company? 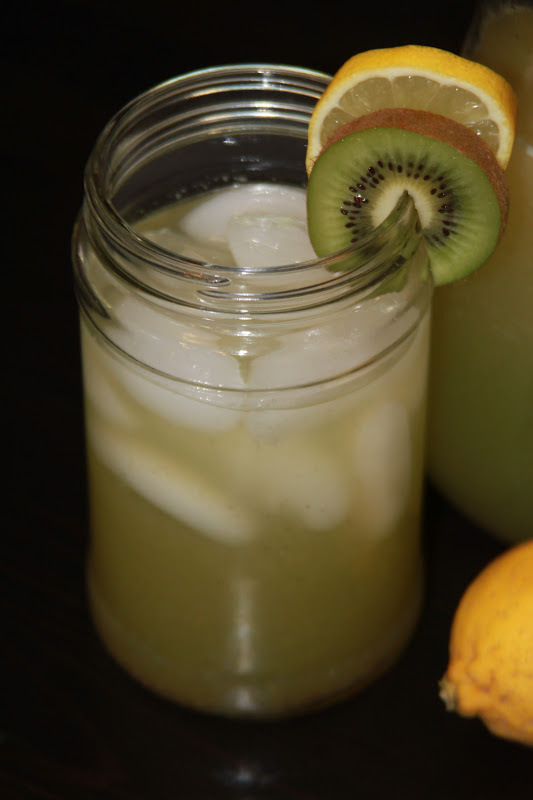 Whichever way you prefer to enjoy your kiwi lemonade, be aware that when you strain the kiwi, you won't get all of the fiber out of it. It is a bit thick, and some seed particles will make their way into the final product. These will settle to the bottom of the pitcher, so give it a good stir before pouring, and be prepared for a hearty beverage. Peel the kiwi and puree them in a blender. Pour the puree into a fine mesh sieve that is sitting over a bowl, and let the juice drain into the bowl. 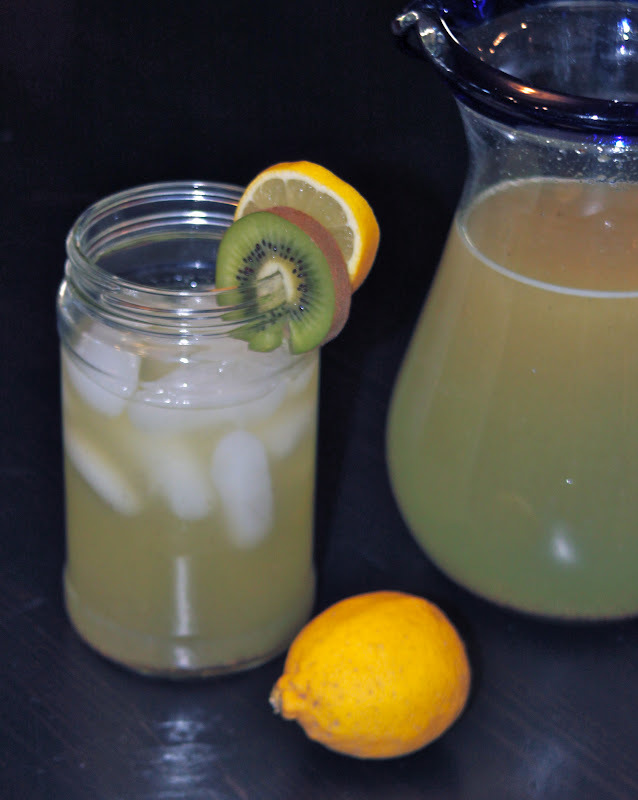 Combine the kiwi juice, lemon juice, water and sugar in a large pitcher. Chill for a couple of hours, and enjoy! If you want to add vodka, either add a cup to the pitcher, or if you prefer to keep it so it can be served either way, add a shot to each glass.